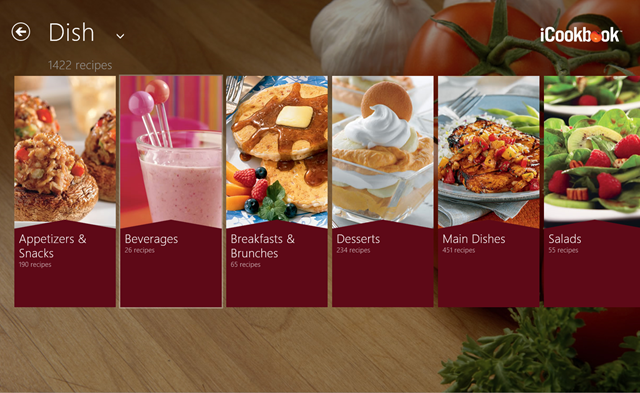 iCookbook is a free Windows 8 cookbook App through which you can browse around 1000s of delicious dishes available world-wide. It’s actually a cookbook that consists of exotic cuisines in large variety to help you learn new dishes everyday, right on your desktop. 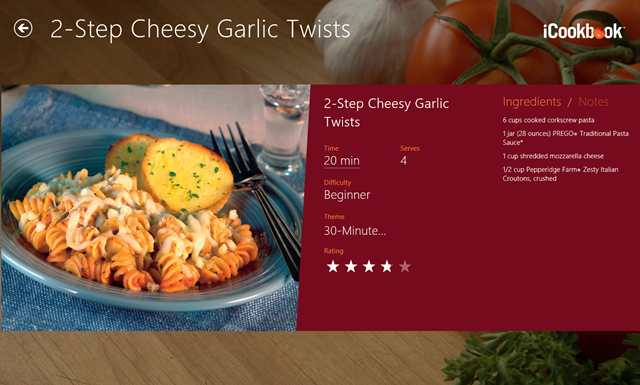 This Windows 8 cookbook app is quite catchy and you can have a long list of dishes which will tickle your taste buds. It will titillate your tongue and will satisfy you taste senses. I was really astonished by watching that such kind of dishes can also possible to prepare at home. Well, in this case, iCookbook will definitely help you to grab the attraction of your audience or say the food lovers. It consists of a huge variety of dishes categorized according to their taste, themes, brands, and ingredients. Just check out the interface of this app for Windows 8, such a delight, you see. The dishes are according to your convenience and also based on your mood. Like today if you want Chinese, you can just click on the Dish section and you can have the con, one day you like Thai food, just browse through iCookbook, and you will have it. iCookbook actually consists of hundreds and thousands of recipes. If you want dessert, you can have it, salad, you will have it within a minute. 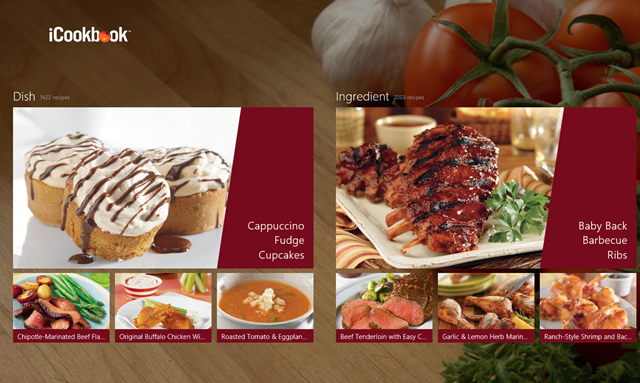 iCookbook Windows 8 cookbook app also contains recipe of branded cuisines. If you have run out of ingredients, then there is nothing to worry about. Just click on the ingredient section and prepare your dish according to your selected ingredients. iCookbook provides you easy step method to prepare a thousands of dishes with their difficulty level and the ratings. You can also note the time duration of the dish to be prepared. So my fellow food lovers just install this little app for Windows 8 from the App Store under the category “Food & Dining” else you can search apps in Windows 8 store.